The aerial photography and atlases series in the Henry J. Bruman Map Collection cover 1965 to the mid 1990s. In addition to the specific sets listed on this page, we have air and satellite photographs for scattered places around the world, usually single images of a given place or region. 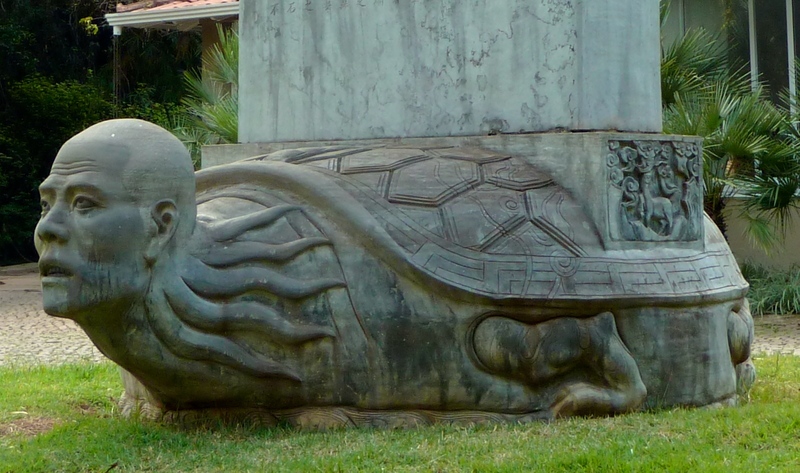 Many can be found in the UCLA Library Catalog. Consult with reference staff to determine whether there are any available for the area in which you are interested. The collection mainly concentrates on the City of Los Angeles and Los Angeles County, with a few images covering adjacent counties. These series vary in scale from 1:40,000 (1 in. = 0.64 mi.) to 1 in. = 100 ft. All of these series are vertical shots, meaning the photo has no tilt in it. With few exceptions they are black and white images. They vary in physical size from 9 × 9 in. to approximately 3 × 4 ft.
Oblique low altitude black and white aerial photographs taken between the years 1918 to 1971. These photographs were taken at a variety of latitudes, angles, and directions, making the collection a huge assortment of unique shots. Areas covered: Extensive coverage of Los Angeles, Ventura, and Orange Counties. Southern California airports, refineries, factories, schools, hospitals, country clubs, motion picture studios, and miscellaneous real estate. Limited coverage of the following California counties: San Diego, San Joaquin, Santa Barbara, Monterey, Imperial, Inyo, Fresno, Kern, Mono, Placer, San Bernardino, and Riverside. Limited coverage of other California regions including the San Francisco Bay Area, Sierra Nevada, Mojave and Colorado Deserts, and the Colorado River. Limited coverage of Oregon, Nevada, Arizona, and other western states. 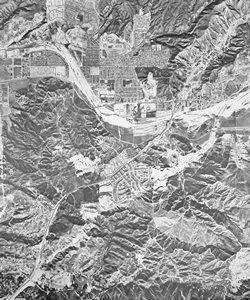 A variety of oblique low altitude black and white aerial photographs of Southern California between the years 1927 and 1964. Similar coverage as the Spence Collection, but not as extensive. Limited coverage of Arizona, Nevada, and other states. Animated satellite images made up of NASA's accumulated Landsat data from 1984-2012 show the visible, real physical changes the Earth has gone through during this time. Access to atmosphere, land cover, snow and sea ice cover, and ocean data layers. Detailed land cover data layers. Virtually cloudless, seamless, and high resolution satellite view of Antarctica. Access to historical and current aerial photography, satellite imagery, and land cover data. Aerial photographic survey of the California coastline. Satellite Image layers available for most of the world, now includes oceans. Free access to aerial photos from the 1930's to today. The National Map includes orthoimagery (aerial photographs), elevation, geographic names, hydrography, boundaries, transportation, structures, and land cover. You can upload other data using the National Map viewer or download files into GIS. View and download US and international data from the USGS. Aerial photographs from 1928 to current for the San Francisco area at varying scales. Search, download, and order U.S. Geological Survey products from the following datasets: Aerial Photographs, Advanced Very High Resolution Radiometer (AVHRR), Declassified Data, Digital Elevation, Digital Line Graphs, Digital Maps, Earth Observing 1(EO-1). Collins, M. R. (1998). Lanham, Md: Scarecrow Press. United States. (1996). [Washington, D.C.? ]: Defense Mapping Agency. United States. (1996). Photo interpretation student handbook.